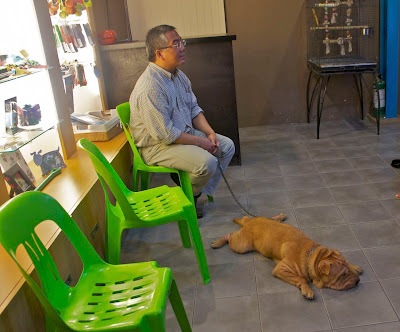 Daddy booked an appointment with Jojo Isorena of Betterdog Canine Behavior Center. We decided to consult with him after an accident that Char Siew had been in a couple of weeks ago. You see, Char Siew had always been anti-social. 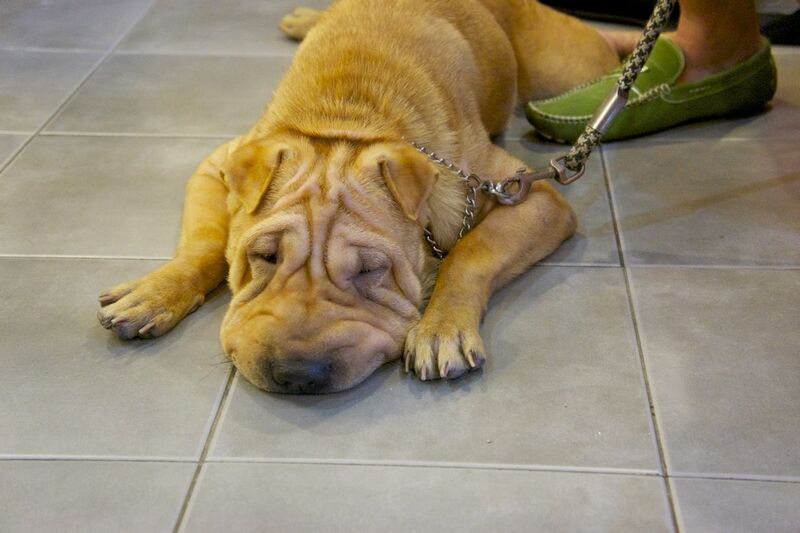 We've heard that Shar Pei can be aggressive towards other dogs. Char Siew is not necessarily aggressive but he does express his dissatisfaction of other dogs by growling. In the incident that we are speaking of, he growled at another dog - as if taunting him in a fight. The other dog responded to his taunt and Char Siew got bit. During the consultation with Jojo, he interviewed us on what happened. He also observed the interaction between Daddy and Char Siew. 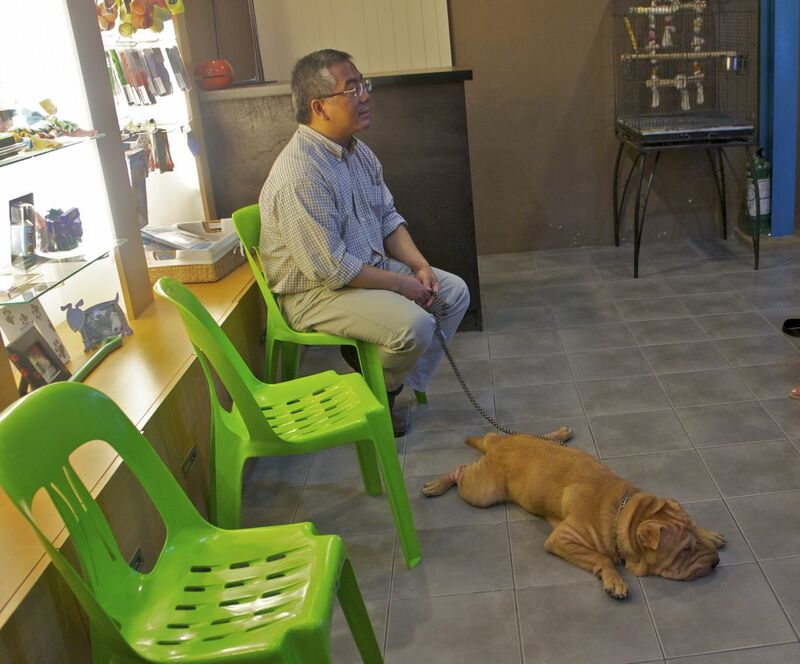 Char Siew and I have been to obedience school previously - so we do understand basic commands like sit, heel, stay. So what was Jojo's assessment? 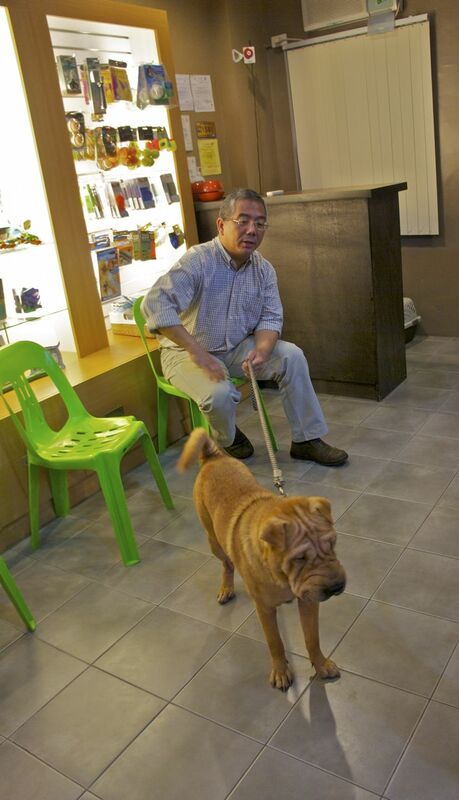 Char Siew is acting out what is natural to a Shar Pei. 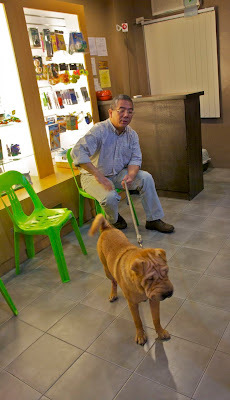 However - upon his observation Jojo thinks that Char Siew has a lot more tolerance with other dogs than most Shar Pei. Moreover - Char Siew also follows the basic commands - so he really doesn't have issues. We just need to make sure that he can understand and he will promptly obey the commands given by Daddy - especially when Daddy says "Leave it". That should keep Char Siew out of trouble. So what was prescribed by Jojo? He recommended that Daddy goes through the Family Dog training. This will allow Dad to go through exercises that transfers the obedience commands to him. Right now - Char Siew and I follow daddy when our training collars are on. Without it - his leadership is only moderately effective. If and when Daddy strengthens his leadership over us - he will be able to manage situations when Char Siew is around other dogs - and command him to stay cool and not pick fights. From what I read about Jojo and his training sessions - this might mean fun exercises for Char Siew and me. This also means more quality time with Dad. I'm definitely looking forward to it. Char Siew says - do I look like a dog who needs therapy? Char Siew stands when he sees a dog outside of the office. More training can never hurt! And mom knows from experience that watching your dog get in a fight is traumatic... and shar pei's always lose, even when they win.. because our skin shreds like tissue paper. I can't tell you the number of times Mom has had to patch up my face, even after just a rough play time with another pup with sharp teeth! Hello Laney. What you said about Shar Pei is so true. Their skin does shred like paper. When Char Siew and I play with each other, Char Siew always ends up with cuts from my teeth. I guess you can say I am one of those pups with Sharp Teeth. My weakness - which you also have - are my floppy ears. They are Char Siew's targets when we play. So I guess for someone like you with the skin of the Shar Pei and the ears of a Beagle -- playing can be fun but also painful.